i picked up this fisher price car at an op shop a few months ago. it was the first thing that i ever let mae try out and she cried when i took her away from it so, of course, it came home with us. and it has been the best $8 i've ever spent. 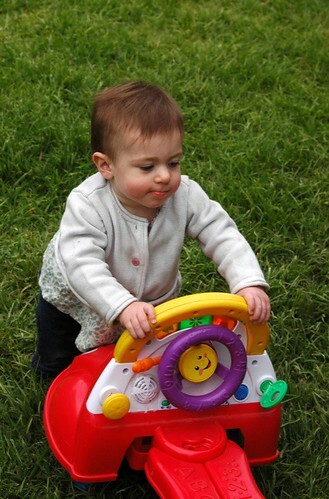 she walks, sometimes runs, around the house and yard with this thing, has just learned how to ride it properly and will point at it and whinge if it happens to be turned off and so not making it's variety of fun noises, sayings and songs. it's probably the reason she's not walking on her own yet but, meh, it doesn't bother me too much. i figure her little legs are going to be crazy strong by the time she figures out it's easier to get around without the car. because mae isn't walking, it's futile to put her in skirts or dresses. she still crawls a fair bit and gets very unhappy when she's pulled short by a skirt caught under her knees. but oh, how i love wee, tiny skirts! how i love making wee, tiny skirts! so much that i've decided to make a few to take to my christmas markets, just to scratch that skirt making itch. i'm sure mae will come out with more than her fair share when she finally gets around to walking, too. Mae is such a sweetie, my little one has been waling about a month & i made her first skirt last week, but there will be more for sure! they are so cute. oops meant to say she's been walking for a month! Such a cutie! I'm commenting on the last 2 posts- I saw that push chair too, and had no-one to get it for, glad yours was cheaper! And yep, skirts are so cute, especially your cute ones. 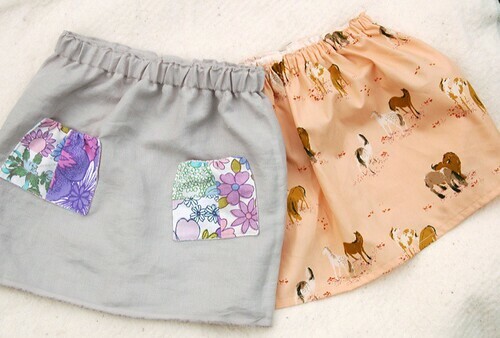 These skirts are painfully cute! I want a girl so badly just to stick her in a bunch of these with cute stripy leggings! xo Meagan. Leslie, those pockets rock! The one on the right contains my favorite of Hayden's Fleur petals :-) It's the supersoft purple floral. lovely skirts. Did you happen to use half yard fabric? I don't think I can find the pink west hill fabric by Heather Ross.